← Five For Friday: Costs of War. Does Digital Tech Lower Income & Reduce Jobs? Brynjolfsson and McAfee explain that while digital technologies will help economies grow faster, not everyone will benefit equally—as the latest data already shows. Compared with the Industrial Revolution, digital technologies are more likely to create winner-take-all markets. once you adjust for inflation, an American household at the 50th percentile of income distribution earns less today than it did in 1998, even after accounting for changes in household size. … the Great Decoupling. 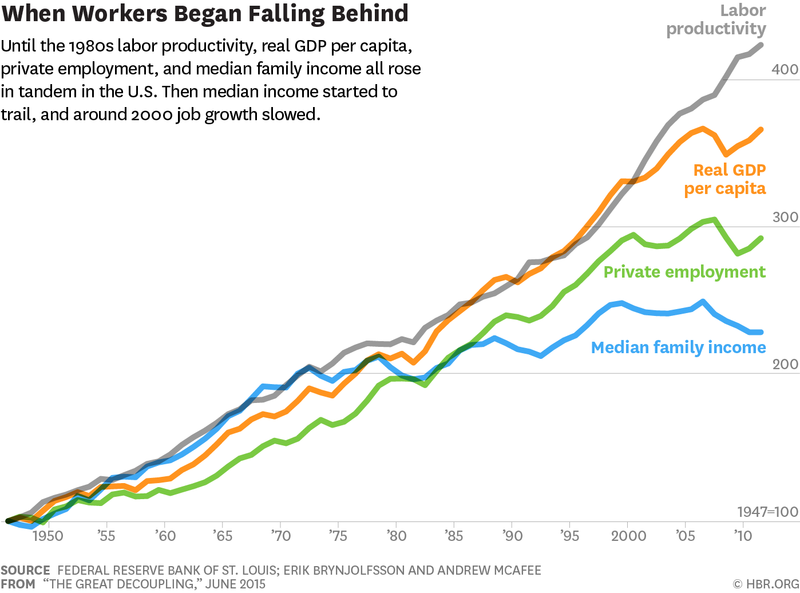 The two halves of the cycle of prosperity are no longer married: Economic abundance, as exemplified by GDP and productivity, has remained on an upward trajectory, but the income and job prospects for typical workers have faltered.